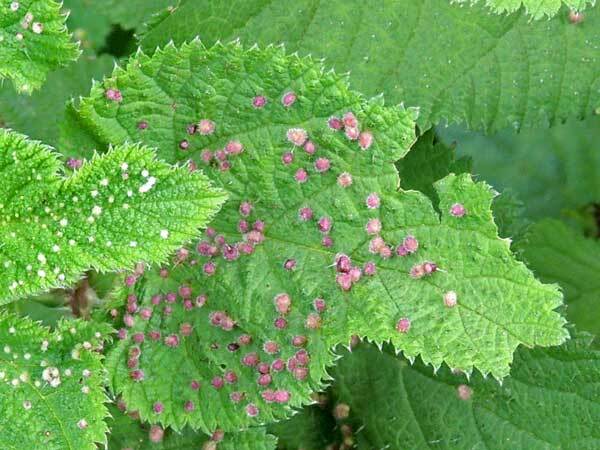 Leaf of Urtica massaica with purple-hued leaf galls likely caused by gall mites. Iten, Kenya. July 2014. Eriophyidae is a family of more than 200 genera of mites, which live as plant parasites, commonly causing galls or other damage to the plant tissues and hence known as gall mites. About 3,600 species have been described, but this is probably less than 10% of the actual number existing in this poorly researched family. They are tiny, microscopic mites and are yellow to pinkish white to purplish in color. The mites are worm like, and have only two pairs of legs. Their primary method of population spread is by wind. They affect a wide range of plants, and several are major pest species causing substantial economic damage to crops. 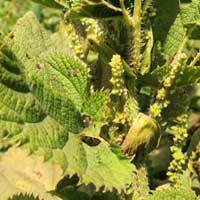 Some species, however, are used as biological agents to control weeds and invasive plant species. Even through a 10x magnifier, the minute arthropods responsible for these plant galls are difficult to see. Under a dissecting scope the galls can be opened carefully to reveal the mites inside.